Travel with Steam Incorporated on this special pre Christmas excursion for an easy and relaxing outing. Perfect for an end of year celebration. We will circumnavigate the Tararuas in a clockwise direction. Plus an option of either visiting the Mauriceville Country Fair or an Opaki vineyard. The diesel hauled train will run from Paekakariki picking up at stations to Palmerston North (Paraparaumu, Waikanae, Otaki, Levin) then travel through the spectacular Manawatu Gorge to Woodville before heading down the Wairarapa and passing through the iconic locations of Mangatainoka and Eketahuna. 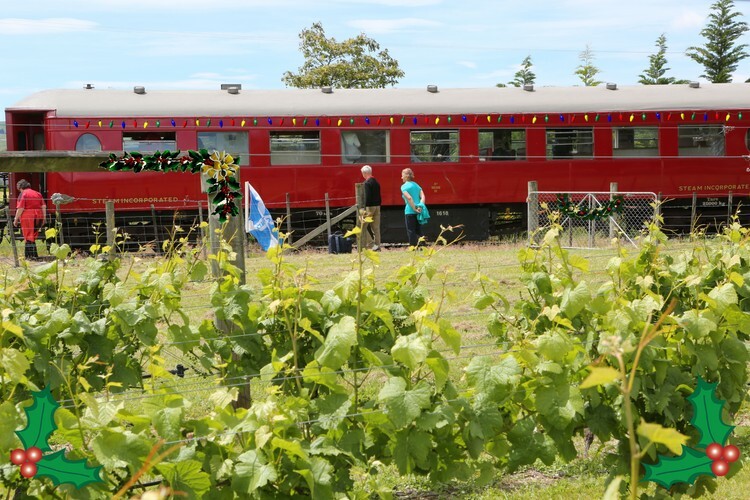 Before arriving at Masterton stops will be made at Mauriceville and Opaki to allow you to visit either the Mauriceville Country Fair or the Paper Road Vineyard at Opaki. Later we travel through the 9 kilometre long Rimutaka Tunnel on the way to Wellington before heading up the west coast back to Paekakariki and dropping off at stations to Palmerston North. The train will be hauled by a powerful diesel locomotive and comprise our fleet of classic red “steel” cars. There will be an open air viewing platform on the train. Also included is a buffet counter selling sandwiches, sausages, hamburgers, drinks and snacks, and a souvenir counter for all sorts of railway memorabilia. You are welcome to bring your own food on the train. The Mauriceville Fair is held at the Clarke Memorial Domain. This is probably Wairarapa's most scenic reserve. This year will see the 18th Fair. Essentially a country fair, attractions include live musical performers, vintage cars and vintage machinery, Clydesdale horse and carriage rides, helicopter rides, children's magician, quick fire raffles and the usual huge variety of stalls selling crafts, food, and other country goodies. A bus will meet the train to transfer you a short distance to the fair. Later you will be bused to rejoin the train at Masterton. A one hour stop will also be made adjacent to the Paper Road Winery & Bistro at Opaki just north of Masterton for a refreshment stop. There will be the option of a pre ordered meal available at the vineyard, or just the opportunity to sample some of the wine and be entertained by our own Wayne Mason. Hot snacks will also be available for purchase. Several other stops will be made during the day for photo opportunities and a leg stretch. You can board the train at Paekakariki, Paraparaumu, Waikanae, Otaki, Levin or Palmerston North in the morning. You will be returned to your boarding station in the evening. Creamy broccoli, cranberry, toasted almond & bacon salad. Chargrilled courgettes, shaved parmesan, leafy greens & toasted pinenut salad. Roast vegetable medley with a balsamic glaze. You will also be served with a complimentary beverage. Choose from a Paper Road Wine (Pinot Noir, Sauvignon Blanc, Rose) or a fruit juice. Later in the afternoon we will serve you a slice of Yummy Mummys Cheese Cake at your seat. Covers bus transfers from train to fair and from fair back to train. Adult $10. Child no charge. One of our active members is the renowned Wayne Mason of The X-ray Catz, Warratahs, Fourmyula and “Nature” fame. He will keep us entertained for those opting for the Opaki stopover.